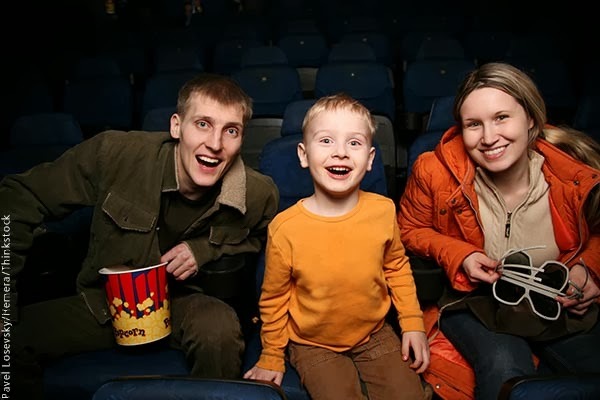 As I was trying to come up with a topic to share on this particular blog, I thought about a challenge one of my young clients recently experienced: going to the movies. This child so wanted to go to The Lego Movie, and he and his dad set out for an adventure they were unable to complete. This is a challenge that comes up for many of my sensory-defensive clients. No matter how excited they may be to see a particular film, their sensory system takes over as they attempt to transition into the theatre and begin to experience a whole set of sensations even before the movie’s start. Parking at a popular movie can present many challenges. You may have to park far away from the entrance and then walk through a maze of cars, drivers, and people. Standing in a line for tickets, entering the building through a door (and sometimes a metal turnstile), and giving your tickets to theater staff can also be problematic. Then, once you have entered the theater, you child may be hit by an overabundance of visual and olfactory sensations at the refreshment area. Lining up to pay for food and drink can add tactile and auditory stimulation. Now, when your child has an already overstimulated nervous system, he has to enter the theatre, where he is bombarded in many subtle ways that can throw his sensory issues over the edge. You have to find open seating and try to squeeze into a spot among other people. Then, when seated, your child may find that his feet do not touch the floor. It may be disconcerting to him, too, that the seat folds up and that food is spilled all over the floor. Other potential hurdles to contend with: the noise level becomes more intense, the smells of different refreshments are distressing, the lights go out, the screen goes on, and the noise frequency changes. If your child has made it this far, this may be the point at which a meltdown or shutdown occurs, most likely ending an eagerly anticipated adventure. As I found myself helping my client’s parent develop accommodations for the next attempt at a movie outing, I ran across an article about AMC Theatres’ sensory-friendly-films. AMC has established a program under which some of the theaters in its chain allow families and children with sensory processing issues to enjoy their favorite films in a safe and accepting environment. In such cases, auditorium lights remain on, sound is turned down, and members of the audience can get up and move as needed to enjoy the film. Once a month, there is a screening specifically set aside to accommodate those with sensory processing issues. Not only does the level of sensory chaos change within the theater, it also allows for acceptance and a positive experience. Theaters providing these screenings are limited in the Bay Area. It would be best to contact AMC Theatres directly to check on your options in your particular area. Feel free to contact me if you would like suggestions on how to prepare for an outing with a child who has sensory processing issues.